We understand that a missing tooth can be an embarrassing thing and cause for you to hide your smile from the world. Whether you’ve experienced damage or decay, our proven implant dentistry services can restore your smile and your oral health. Placing dental implants is a common procedure in our dental practice and very popular among a multitude of satisfied patients. With the right tooth implant, you can feel amazing about your smile and regain your confidence. 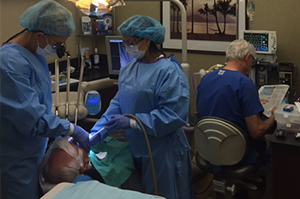 Our patients throughout the Carlsbad – Encinitas – San Marcos CA area love that they can receive the entire dental implant procedure at La Costa Dental Excellence — from diagnosis to placement to adding the dental restoration (dental crown, dental bridge, denture, etc). This offers both convenience and, perhaps more importantly, continuity of care so our patients can work with the same doctors throughout the entire process. A tooth implant is made to work exactly like your original tooth root, and acts as an anchor for a dental restoration. If dental implants are the right choice for you, the tooth implant is gently placed into your gum. When the implant is established, we then place your dental restoration - whether it’s a dental crown, dental bridge or denture- on the implant to finish the process and give you a wonderful result you can truly smile about. teeth, dental implants can greatly improve your oral health and allow you to maintain your regular home dental care routine. Convenience | Our practice places AND restores dental implants. This means you only need to visit one dental practice for the entire lifecycle of your dental implant(s). Beautification | Your smile is often the first thing people notice when you walk into a room. If you’ve dreamed of having a stunning, head turning smile, our fantastic implant dentistry services can make your dreams come true. Normalize Eating Habits | A missing tooth can often cause pain and make eating your favorite foods very difficult. A tooth implant can close up those gaps, allowing you to enjoy the foods you love. Feel Great | Rebuild your confidence by rebuilding your smile! The embarrassment caused by missing teeth can be paralyzing, and implant dentistry can help you achieve an incredible smile to be proud of! 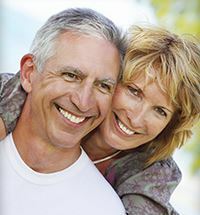 Call our Carlsbad office today to learn more about how our restorative dentistry, and dental implants specifically, can improve your dental health and give you a beautiful new look! You can also schedule a tooth implant consultation by texting us or using the form on this page. We are located in Carlsbad and are easily accessible to all of North County including Encinitas and San Marcos, CA.